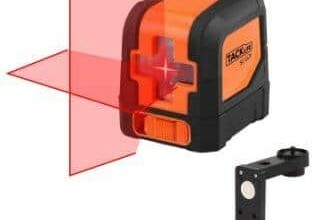 Do you wish for a great laser level which helps in increasing the efficiency with your projects of construction? 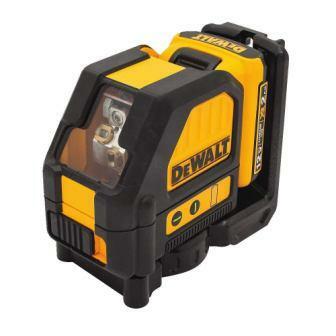 Well, the ultimate one for you would be the ‘Dewalt DW088LG Cross LineGreen Laser Level’. You will definitely achieve a higher range of visibility of approximately 100 feet, considering that the laser diodes are green in color and are more visible in comparison to the red colored laser diodes. 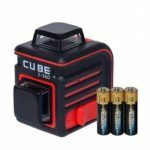 Moreover, since it is compatible with the battery of the 12V lithium-ion type, this ensures that you will acquire a much longer battery life. Also, having a tool with rechargeable battery power is a matter of great convenience. 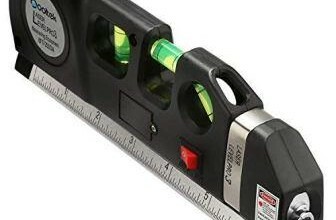 This great laser level features cross lines that are self-leveling. This sets up brilliant crossing horizontal as well as vertical lines for various leveling or layout applications. Also, the ‘Dewalt DW088LG’features the inbuilt bracket which is magnetic. This means magnets have been firmly fixed on the tool’s rear segment which allows even attachment to metal as well as steel tracks. One more feature of the ‘Dewalt DW088LG’is that It includes a mode for ‘full-time pulse’ which attempts to offer its use accompanied by a detector. Further, its debris resistance or IP65 water help in avoiding damage to its internal components. All these exceptional features render the ‘Dewalt DW088LG’to be the most ultimate green color laser levels available for sale. An important feature of this device is the tools’ use of the technology called the ‘Green Beam Laser’. This enables it to achieve its increased brightness (4 times more) in comparison to the ‘red’ beam laser. 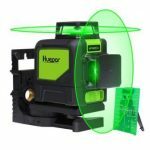 This laser offers a much brighter as well as longer visibility range beneficial to interior or exterior applications which improves its accuracy drastically during the leveling task. This laser projects brilliant cross lines of both horizontal and vertical type. These cross lines assist in several applications of either leveling or layout. Accompanied by a mode that is ‘full-time pulse’ type, it offers you the facility to operate the tool along with the laser detector. Also, this maintains complete brightness spread throughout its visibility and range. The tools inbuilt magnetic brackets offer even attachment to metal as well as steel brackets. It offers support threads of 1/4 inch, as well as 5/8 inch for the back, mounted magnets. These features will definitely allow you to handle your vertical or horizontal leveling tasks easily. For prevention of damage to the tools’ internal components, it has a housing that is over-molded and inbuilt IP65 debris or water resistance. Furthermore, its feature of the ‘locking pendulum’ also helps in preventing damage to internal components. Features like these improve durability and ease the tools’ routine maintenance. In order to build up its effectiveness during operation, the ‘Dewalt DW088LG’possesses a power battery of 12V lithium-ion type which is rechargeable and provides additional-long life span. Recharging its batteries makes it very convenient. Provides brighter visibility (four times more)by the use of ‘Green beam laser’ technology. Offers great precision and accuracy (at distance of 100 feet ± 1/8). Provides a lengthened range of visibility of a hundred feet in comparison to the fifty feet offered by the red laser. It is water and debris resistant. Has incorporated magnetic brackets accompanied by threads of 1/4 and 5/8 inch. Includes a mode of a full-time pulse which is accompanied by a detector for use. Provides 3-years of warranty period. Its usage of the technology called ‘Green beam laser’ increases the cost of the tool a lot compared to the laser of red beam. This Laser can be efficiently used in various layout and leveling projects of construction. Self-leveling is the line laser’s best aspect. Its working is so simple that you only need to set it at the location of your leveling or layout activity. Further, just start the task with a simple button press. In addition, in case you wish to utilize this ‘green laser level’ for leveling of long-range (e.g. more than 100 feet) then you ought to consider combing the laser detector, which is possible. For the maintenance of this tool, features such as the resistance with IP65 water as well as dust, locking pendulum and a casing of an over-molded, avert damaging of the tools’ internal parts. A simple job of maintenance which you can do is to use a damp cloth and simply wipe the tool after use. This can also improve the tools’ longevity. Apart from that, other routine maintenance tasks are mentioned in the tools’ manual. This laser projects brilliant cross lines that are the self-leveling horizontal and vertical type. Technology that is 4-times brighter than the red beam i.e. ‘Green beam laser’ technology is used. Inbuilt magnetic bracket combined with threads of 5/8” and 1/4” at its rear segment aids in even attachment with steel and metal tracks. A housing of over-mold type as well as the resistance of IP65 debris or water. ‘Dewalt DW088LG’ Laser is among the best green beam type of laser levels available. 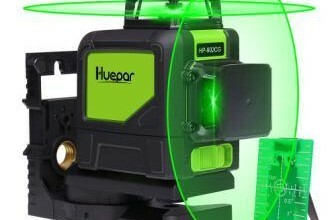 It offers improved layout precision by its green beam that is four times more visible than the red beam and also provides much greater leveling accuracy of long-range. If you are searching for a laser level of cross line type which offers great leveling accuracy combined with efficiency, then you have the ‘Dewalt DW088LG Laser Level’. Although the technology of ‘Green beam laser’ makes it expensive in comparison with similar laser levels using ‘Red beam’ type of laser technology, you will definitely not regret spending extra on this investment which is among the top models of its kind.